Lancelot Grand Cru is brewed in the finest artisan tradition and available in limited quantities. This pure malt beer is triple-fermented and un-filtered. Celebrating the 25th anniversary of the brewery in 2015, Lancelot's brewers team has crafted this exceptional beer. 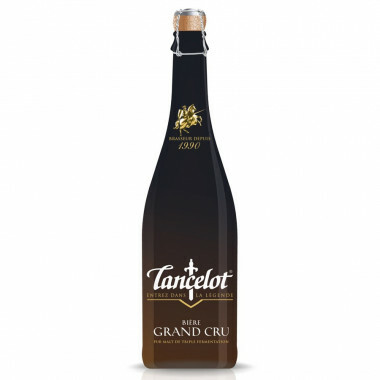 Lancelot Grand Cru (Great Vintage) results from the craftsmanship of the company, born in 1990 in the heart of Brittany near Brocéliande forest. Lancelot Grand Cru is brewed in the finest artisan tradition and available in limited quantities. This pure malt beer is triple-fermented and un-filtered. It has a full-bodied, quite aromatic and rich taste, and a beautiful colour with ruby highlights. To taste all of this beer's rich aromas, the brewery recommends serving it in a wide chalice type glass, at a temperature of 8°C. Nose: aromas of malt and frain, fresh alcohol notes, nuts and a light touch of aniseed. Palate: quite similar to the nose with a touch of caramel. Rather dry.